I use a hair straightener fairly regularly as I have still not accepted my hair’s natural texture. My hair is dry, curly and prone to frizzing which makes it incredibly hard to manage. I have recently been on the lookout for a quality high-heat flatiron, as my trusty hair straightener is nearing its expiry date. I’m pleased to announce, I have found the one! The EVY iQ-OneGlide has everything I have been looking for and more! It’s sleek, stylish and is about to rock your hair world. Created by Tracey Bazzano-Lauretta, a hair stylist come product developer and CEO of AquaBaci, meaning water (Aqua) and kiss (Baci) in Italian. This is at the core of every EVY Professional product, a kiss of hydration for the love of healthy, fabulous hair. Aussie company AquaBaci has teamed up with Ultimate Salon Supplies as their official partners in servicing WA with all the AquaBaci brands which include: EVY Professional, EVOX, Evolution Keratin and Hair Colour Chemistry. Ultimate Salon Supplies are WA’s #1 Hair & Beauty wholesaler, Trusted by 1000’s of premier Hair & Beauty Salons and Day Spas, they are the preferred supplier to Perth’s beauty industry. Every EVY Professional hair styling tool is infused with a unique patented mineral technology, which is a blend of 32 rich post-volcanic minerals sourced from a remote region in Japan. It is the ONLY brand with 32+ minerals in thermal styling tools. These amazing naturally resourced minerals generate negative ion and far infrared energy. They work to micronise water into fine particles so they are better able to penetrate the hair shaft, injecting hydration and moisture into the hair as you style, resulting in smoother and healthier hair. New technology plates contain 24-carat gold for a smoother glide. Metal ceramic heater for faster heating. Rubber coating on irons delivers a soft-touch finish for a smooth glide when curling. If you think that’s impressive then you may be interested to know that it has been awarded the winner of 2017 Australian Hair Fashion Awards Most Innovative New Styling Tool. 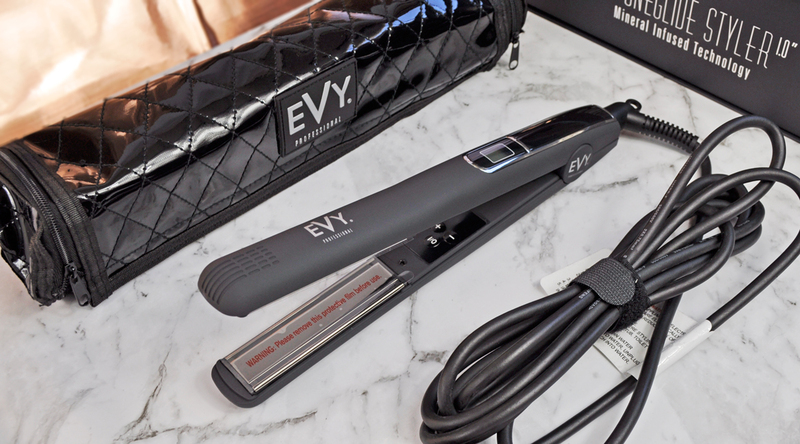 EVY Professional is the new generation in advanced ion-powered hair tools, delivering hair-loving minerals to the hair follicles so that it rehydrates, reconditions and restores moisture balance to the hair as you style. How To Use: Pass the iron down the hair with a medium speed and even tension – this will give you faster smoothing, straightening and shine in just ONE GLIDE! Final Thoughts: All in all, every day is now a good hair day! This must have tool has cut my styling time in half. It heats up quickly and straighten’s on the first pass which lowers the risk of heat damage. It comes with a convenient bag that has a heat-resistant lining on the inside which unzips to become a safe surface to rest your styler. It’s ergonomic & lightweight which feels easy and comfortable to maneuver for creating different styles. It leaves my hair looking silky smooth and infused with incredible shine. I’m loving it! Price: EVY Professional iQ-One Glide RRP $299 | You can find EVY Professional products on the AquaBaci website www.aquabaci.com.au | Click here to find a stockist near you. Fantastic post! Although I don’t use hair straighteners often or regularly even because my hair is naturally straight!!!!!! But I really liked this one! This looks wonderful! I think your before hair is lovely, personally. Wow I love that this injects moisture into the hair and hydratres it, how clever! Sounds like a fantastic Styler! Your hair looks so shiny after using it! My favourite styling tool is my Parlux hairdryer. So light and powerful! I really do love the look of this, and the results are amazing! Wow this sounds awesome! I’ve still got my good ole GHD!